Aircraft navigation system : Aeronautical engineering projects ~ Engineering projects ideas for final year students & paper presentations collection blog. 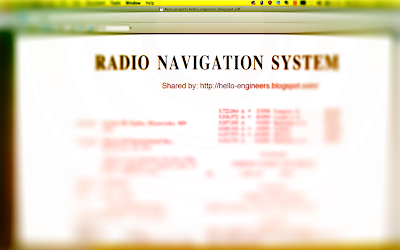 Title: Aircraft navigation system projects. Department: Aeronautical engineering, communication engineering, radar technology. Can be used for: Study purpose, engineering projects for aeronautical students, paper presentation works. This is a BE project that has a research paper. This paper was originally invented by Cucius O. Taylor. Mostly students studying aeronautical engineering are planning for their final year projects in designing or modeling. We find not much students who think out of the circle. This particular post on Navigation system will be every innovative and unique for competitions and projects. Because this will deal with radio communication and radar technology also. This will definitely open minds towards various other parts of engineering. So, we highly recon this project for both aero projects and eke projects. The project description: It has a navigation apparatus that will include a radio receiver, with directional antenna, a memory unit to store the location based on reference point around the spot, a processor for processing and analysis. So this set up of the navigation apparatus is connected to a computer at the aircraft. At the remote end there is an antenna to receive the location signals from the aircraft. Sample of this Aero projects for engineering students: Global positioning systems (GPS) have become nearly ubiquitous as navigational aids, for individual users as well as, more importantly, aviation users. GPS receivers are accurate and relatively inexpensive, and they are also easy to use, because they are area navigation (RNAV) systems. RNAV systems allow navigation on any desired course within the system's area of coverage. In other words, an RNAV user is not limited to following a specific track to or from a radio navigation aid (as a user must with some navigational aids), but can simply plot and follow waypoints that make up an RNAV route. For aircraft navigation, GPS is currently used mainly as a supplemental RNAV system, although there are plans in the United States to make GPS the primary basis for radionavigation by the year 2010. There is a strong economic motivation to use GPS as a primary basis of navigation due to the expense of maintaining land-based navigational aids (navaids) currently in place, such as LORAN, VOR, DME, etc. For critical uses such as aircraft navigation, however, the very low power signals employed by GPS satellites can beacause for concern, especially if GPS is used as a primary basis of navigation, rather than as a backup system for other established navigation systems. Specifically, the extremely low-power GPS signals may be susceptible to jamming or interference due to weather conditions, radio noise, or other sources. This is true even though GPS augmentations such 35 as the Local Area Augmentation System, Wide Area Augmentation System, and other augmentations can improve the accuracy, integrity, and availability of the basic GPS.